1. People are so interested in how you ended up at the Cordon-Bleu. Tell us about that. I’ve always really enjoyed cooking and baking, but never had really thought about it as a career until my senior year of college. I worked part-time at a little bakery and fell in love with it. Since college, I’ve been working in the food industry. 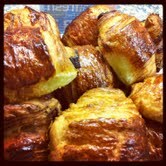 First at a cupcake store, then at a restaurant in the pastry department. I knew that if I really wanted to pursue this, I wanted to be the best. I looked into a few schools in the U.S., but decided that if I had the opportunity to come to Paris, I couldn’t pass it up. My classes are broken up into two different sections. First, we have the demonstration classes. 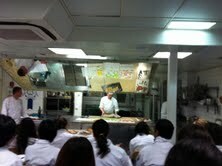 This is where the chef goes through a certain recipe, and makes it for us in class. We sit and frantically try to scribble down all the steps and techniques. This is more of a classroom setting, with all the students sitting in desks, and the chef at the front with a teaching kitchen. The demonstration classes are about 3 hours long. Secondly, we have our practical classes. This is where we take what we learned in class, and have to make it ourselves. We go upstairs to the big student kitchens where we all have our own little sections. We have 2 1/2 hours to finish the recipe. This is where we pass or fail. Eek! There are about 25 students in my demonstration class, and about 12 in my small practical class. It is a VERY international bunch with people from Australia, Korea, France, Syria, The United States, China, Brazil etc. All over the world! 3. Have you found that such an intensive program diminishes your love of baking at all? No way! I still really enjoy to bake at home, especially things that are different from what we are making in class. Sometimes we have extra dough or things from class, and it is really fun to bring it home and find some other uses for it. 4. What would you like to do when you finish the program? I would really like to work at a nice restaurant when I am finished with school. Something like a farm to table, where they would focus on organic and in season goods, would be ideal for me. I will definitely be coming back to the U.S., but I may do a short internship here in Paris beforehand. I would also love to open up my own place eventually, but I don’t think anytime soon. Too much commitment! 5. What do you like about living in Paris? What do you not like? I love living in Paris because there is always something to do or something to discover. The city really is a lot smaller than you think. I like that I can just walk to any museum or park whenever I want. The city never really seems to be in a rush, it is very refreshing. My favorite thing is that there are amazing little bakeries, chocolate shops, and pastry shops on every corner. Let me just say, thank God the scales are in kilos here and I just seem to forget how to convert it to pounds. I am really skinny in kilos…. I think the thing I don’t enjoy the most about Paris is all the cigarette smoke. Everyone smokes here, and you cannot walk down the street without getting a big puff of it in your face every few minutes. I would also say that I miss the convenience of certain things. It is always nice to just walk out your front door and drive over to your friend’s house. Here, everything has to be planned out, and going somewhere that would take 5 minutes in a car, could take 30+minutes on the metro. I definitely get a lot of lessons in patience here. 6. 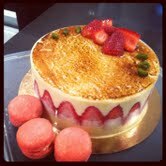 What kinds of desserts do you make in the class? What have been your favorites? My classes really focus on classic French techniques and desserts. My first Basic session, we learned to make a lot of doughs, tarts, things like that. This second Intermediate course that I am in now focuses heavily on more intricate layers, mousses, cooked sugars, creams and sauces. My favorite desserts are always the ones that have some sort of crust involved. I am a sucker for puff pastry. 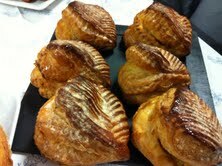 I think you could wrap a tennis ball in homemade puff pastry and I would still enjoy it. Here are a few pictures of some of my favorite desserts so far. 7. Was it hard to get into the program? No it was not necessarily hard. The school prefers that you have had some experience in the industry beforehand, but I know some people in the my program that we pretty green. I think if you intend on going to Le Cordon Bleu, they understand you are pretty committed. Plus, once you are in program, you have to pass to get to the next level. It is not very hard to fail, which is always a scary reminder! 8. Many Americans think that French people are snooty and cold. Has that been your experience? While I have had some poor experiences with the French, I have definitely had many more positive ones. I don’t think that the French are necessarily cold, it is just a difference in culture. You are always going to find a few bad apples wherever you go. Merci, Mlle Cordon-Bleu! Is everyone inspired to go bake something delicious now? I guess I have left you all in suspense long enough. I told you that when we finally arrived home from our very delayed flight from Malaga, we received a nice surprise. Here is how it went down. A dear neighbor of mine from Houston was coming to Paris on the day we left for Spain (I hate it when that happens) and was leaving early Monday morning. She was to come over to our apartment when we returned on Sunday night, but as that time approached 11:00, I was afraid she wouldn’t come. Never underestimate the fortitude of a Texas woman! She did indeed come over, and look what she brought! It was the Texas mother lode! I didn’t realize how much chicken broth I used until I had to make it from a powder each time. How did she ever carry four boxes? And take a look at those bags of precious pecans! 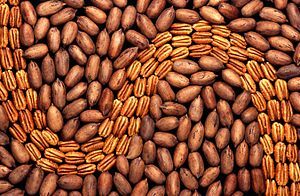 I never met a dessert I didn’t think could be improved by a handful of pecans, and now I have many a handful! Just in time for pecan pie at Thanksgiving, too. The Hot Tamales were for Martha, although I admit I have thrown back a few. And the Arm and Hammer toothpaste reminded my mouth what clean teeth are supposed to taste like. I think Mark must have asked her for the potpourri of candy, as he is The Candy Man around here. It makes me so happy just seeing these things in my pantry. Life is sweet when friends surprise you with tastes of home. But wait–there’s more! This friend also brought me her daughter, who is starting pastry school at ……the Cordon Bleu!!!! She hasn’t found an apartment yet so we asked her to please stay with us for as long as she needs to. She is a doll, and best of all, Martha has been a big fan for several years, so she is thrilled to have her here. “Mademoiselle Cordon Bleu” promises that soon she will be bringing home plastic containers of The Lesson Of The Day-how sweet is that? I am already peppering her with questions about what the school is like. 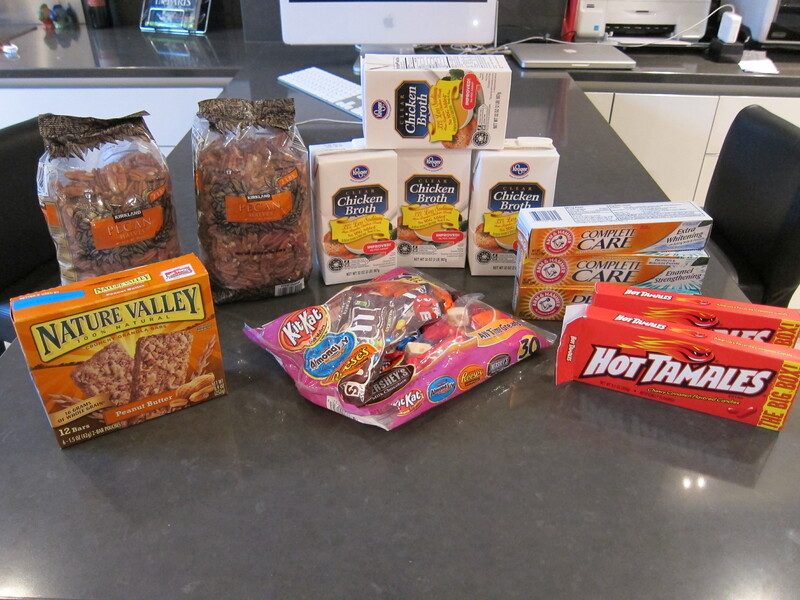 Maybe I”ll get enough scoop for a blog post- or at least enough treats for some blog photos! We are hoping she doesn’t find an apartment anytime soon. Mark was in Houston until just hours before our departure for Spain, and while he was there another sweet friend gave him a few more Texas treats for me! The red pot is a candle that smells just like a Christmas greenery, which will be sadly missing from Chez Mai Paris. We will definitely light that baby up, but not until after Thanksgiving. 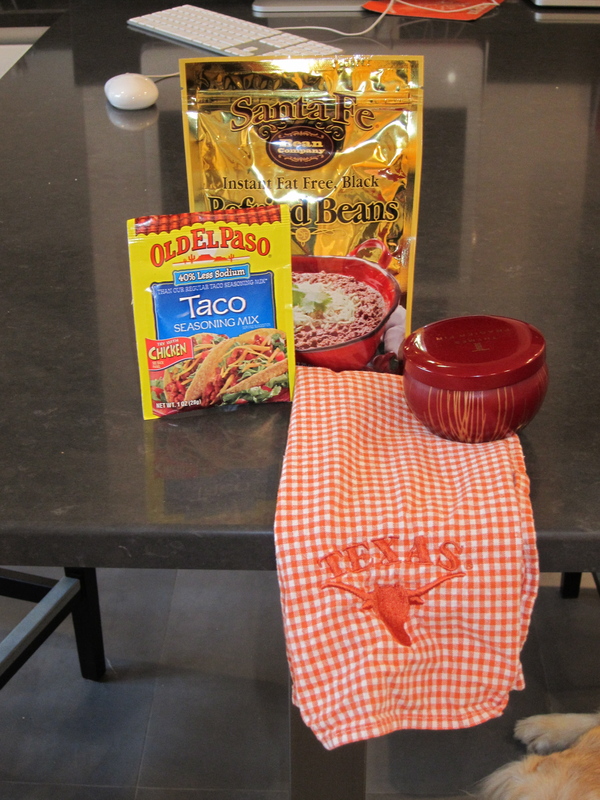 Tacos and beans- sounds like supper! Finally, “Mom Cordon Bleu” also brought me a package wrapped in my beloved blue and white paper from Blue Willow Bookshop. 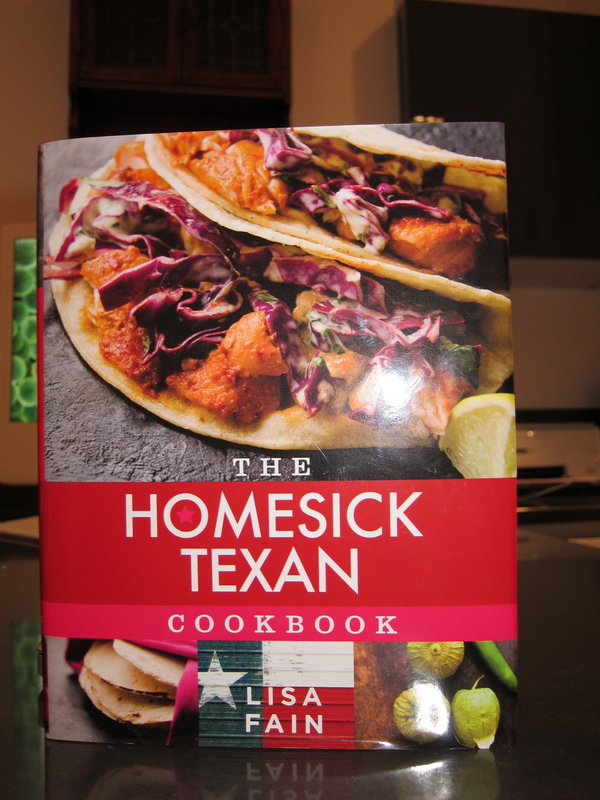 I think I got teary-eyed before I even opened it to find a copy of Lisa Fain’s new cookbook, The Homesick Texan. I have followed her blog, The Homesick Texan, for a year or so and have bookmarked many recipes along the way. I was sorry to miss her signing at Blue Willow, and my friends there were so sweet to have Lisa sign a copy for me (“From one Homesick Texan to another”), and then to write little notes in it themselves. It is so nice to be reminded of home and all the love that resides there. Unfortunately, I don’t think Paris is on Lisa’s book tour, but if it were, I would ask her to bring me some chilis, because those Spinach and Sour Cream Enchiladas with Tomatillo Salsa sure look good. Eat some Tex-Mex for me this week, friends, and I’ll think of y’all when I bite into that chocolate eclair that somehow followed me home from the patisserie on the corner!